The Max number of bars in a song can be set here (currently limited to 800) and if you want to use rubberband for sample time-streching (see Sezione�9.5.2) you need to enter the path where rubberband is installed on you system here. Il driver Jack necessita del server audio Jack (Jack Audio Connection Kit), un server audio professionale col quale e' possibile raggiungere bassissime latenze e l'interoperabilta' con altri software audio. Raccomandiamo fortemente di usare questo driver per ottenere il meglio da Hydrogen. Fig. 4 La linguetta Audio System. See Sezione�10 for more info on Midi actions. *.h2pattern: XML file describing a single pattern. Patterns are group of beats and are managed in the pattern editor. *.h2drumkit: a compressed and archived folder containing all sound samples composing a drumkit and a description XML file. Drumkits are basically group of sound samples. [CTRL + O] = Apre file. [CTRL + S] = Salva file. [Backspace] = Ricomincia la canzone o il pattern da capo. Fig. 11 Esporta un drumkit. Instruments: this menu offers instruments and drumkit (sound libraries) functions. Import library - Imports another drumkit from the local filesystem or download it from a remote location through an XML feed. The XML file that should be provided is NOT RSS compliant (see Hydrogen website for an example). To load another drumkit in your current working session of Hydrogen, read Sezione�8. Playlist editor - A tool to manage playlists. Preferences - Open the main preferences window. Read Sezione�3 on how to configure Hydrogen. Fig. 10 Importa un drumkit. Print Objects - Print on stdout current objects map. Choose between "pattern" or "song" mode: in "pattern" mode only the currently selected pattern will play, while in "song" mode all patterns inserted will be played. Set Pattern/Song Mode. When Song mode is selected Hydrogen will play the complete song. This is the sequence of patterns you have created in the Song Editor (see Sezione�5). When Pattern mode is selected Hydrogen will play the pattern that is currently selected, and thus displayed in the Pattern Editor (see Sezione�6). Set measure type and Beat Counter (see Sezione�4.1). The button in the bottom right-hand controls the auto-start feature, and it toggles between S and P. When it shows P for (Play), the song will set the new tempo and automatically start to play after you tap the right number of beats (if it's not already playing, of course). This way, if you have the BeatCounter set up for 4/4, you can tap 1-2-3-4, and start playing on the next beat. When it shows S (for Set BPM), the auto-start is disabled. For example: Suppose you have a live band, Hydrogen, and a softsynth that is controlled by Seq24)... and you want them all to start at the same time. Set the beat type to 1/4 and the number of beats to 4. Enable auto-start (button shows P). Count off the band 1-2-3-4 (while tapping the comma key) — and everyone starts on 1. Another example: Same situation, but the song doesn't require Hydrogen or synths until some point later. During that time, a human (e.g. guitar player) will be setting the tempo. On the measure before Hydrogen is supposed to play, tap the comma key 1-2-3-4 with the beat... and you're in on the next beat (at the right tempo). If you are using the JACK Transport, the BeatCounter continues to work. If another program is the JACK Transport Master, Hydrogen will respond to tempo change events from that application. Note that in this situation, Hydrogen is supposed to be a slave, so some of the BeatCounter features will be disabled or will not work properly. If Hydrogen is the JACK Transport Master, tempo changes from Hydrogen will be reflected in those programs (if they support it). Note that these can be set to positive (+) or negative (-) values. In order to find useful values for these, you will need to take some time to play with it. Also, you may want different values depending on the speed of your hardware, audio devices, drivers, etc. Using the BeatCounter effectively requires practice. Completely delete all patterns (asks for confirmation!). Create a new pattern (and asks for a name). Move currently selected pattern up or down. For more info on this see the SELECT_NEXT_PATTERN midi action in Sezione�10. Note Length / Note off : these are 2 different ways to define the duration of a note. See Sezione�6.3 for usage. Note that Hydrogen can also be switched to 'per instrument output' mode (see Sezione�3.2), and in this mode all channel strip outputs will be available in Jack (not just the Master output). This allows you to route the individual instruments directly into any other Jack enabled application (eg Ardour) and gives you a lot more flexibility. First of all a little history on the Sound library and Drumkits. Hydrogen began as a dedicated drum machine but has evolved into a versatile sound synthesizer/sequencer that is capable of generating and manipulating all sorts of sounds. Hence the original "Drumkit" terminology is slightly misleading. You can load any kind of sound into a "Drumkit" and manipulate that sound just like playing a regular synthesizer. This is also the main reason why the Piano mode was added to the pattern editor (see Sezione�6.5). To load a drumkit from here, right-click the drumkit and select Load. This will replace your current drumkit with the one that you selected. To load a single instrument from that kit, left-click the plus to the left of the drumkit's name to show all the instruments. With your left mouse button, click and drag the instrument into your current kit. The instrument will be added to the drumkit that you currently have loaded. These are your own drum kits that you can manage yourself. They are usually stored in $HOME/.hydrogen/data/drumkits. When you are creating a new drumkit, you can save it here by selecting Instruments → Save library. How hard you hit a note. Fig. 3 Selezionate un effetto. The amount of time to go from full velocity to the sustain volume. The level (how loud) to hold the note between the sustain and the release. It is a percentage of the velocity. It does not depend on time. Fig. 8 Carica un drumkit. Scegliere fra quelli installati. Typical samples that are used in Hydrogen are: the sound of a single drum hit, the sound of a single cymbal hit, the sound of a single cowbell hit. Whenever you put a note in the pattern (or play a note using MIDI), Hydrogen will play whatever sound you have loaded. So, to put together a drum kit you need to gather short recordings of the bass drum, each tom, each cymbal, the high hat open, the high hat closed, the snare drum (snare on), the snare drum (snare off), rim shots, etc. However, there are no rules about what a sample can be. It's not uncommon to use Hydrogen to trigger non-drum sounds like: audio clips of people talking, a clip from a song, sound effects, audio clips from movies, and famous people speaking. Be creative! TIP : Instead of creating your own drumkit, you can also use or download existing drumkits using the Sezione�8. Select an instrument to start editing it. This is done by left-clicking on the name of the instrument in the instrument list (at the left). You will notice that the name of the instrument in the Instrument Editor matches the one that you clicked. Mute Group: Which mute group this instrument is a member of (see Mute Group). Filter Parameters: Bypass, Cutoff, Resonance. It's important that you understand Sezione�9.1 in order to continue on. If the sample is shorter than the times that you specify, the sample will end, regardless of which phase of the ADSR it is in. If the note is sustained, it does not draw out the note while you are holding it. It only holds the gain (volume) parameter during that time. The gain sets the overall volume for the sample. This gain is applied after the gain that you set for the layer, and before the gain that is set for the mixer. If the Gain is 0, the instrument will be silent. If the gain is 1.0 the volume of the samples will not be adjusted (i.e. 0 dB). If the gain is set higher, the samples will be amplified. It is very easy to set the Gain too high, causing your sample to clip. Remember to test the gain with full-velocity notes. If you clip your signal here, it will only get worse as Hydrogen processes it. Hydrogen provides more mute groups than you know what to do with (over 256). A mute group is a grouping of instruments that are mutually exclusive — only one instrument may be playing at any time. If one is playing and another instrument in the group is triggered, it will immediately silence (mute) and start playing the other instrument. This is useful, especially, for instruments like hi-hats where the open sound and the closed sound are different instruments. The filter is a low-pass resonance filter. If you don't wish to use is, click the BYPass button so that it's red. If it's not red, then the filter is active. The cutoff parameter adjusts the cutoff frequency for the filter. The resonance parameter adjusts how much to resonate the cutoff frequency. If the resonance is set to 0, then the filter is just a simple low-pass filter. The cutoff frequency of the filter varies with the sample rate of your audio card. The range of the knob (0 to 1.0) is optimized for a 48,000 kHz sample rate. For each instrument in a drum kit, you can load several samples and set different synthesizer parameters. This section will step you through how to create a new instrument and load the samples. Now, you need two samples. Any .WAV or .FLAC file will do. Hydrogen provides several in the data/drumkits directory. In the instrument editor, click on Layers. You can layer several samples into the instrument. Which one is played depends on the velocity of the incoming note. Click Load Layer and point the Audio File Browser to your sample. Note that the Audio File Browser will allow you to preview the sample before you load it. It will also allow you to load more than one sample at a time. But for now, only load one. After you load the sample, you'll see that there is now a 1 at the top, and the topmost rectangle has turned light blue. To load a second sample, click the slot just below it, and then click Load Layer to bring in another sample. After bringing in both samples, you'll probably notice that only the first sample is being played whenever you trigger the instrument. This is because you need to set the velocity ranges for the layers. Move your mouse to the sides of the light blue rectangles and you see that you get a left-right drag cursor. Now drag the sample to the left or right (like a curtain). You will now see Layer 2 appear. For each layer, you can set the Gain and the Pitch. The pitch also has a Fine adjustment. Use the Gain adjustment to control how loud the sample will play. This is necessary because it's extremely difficult to get a set of samples that all sound at about the same volume. By adjusting here, the samples that were recorded too quietly can be turned up to match your loud samples (that had to be turned down). If you are using Ubuntu you can install rubberband from the Software Center (rubberband-cli). For other linux distros check your package manager. For other platforms please check the rubberband site . After installing rubberband you should check if the path to the rubberband cli is configured correctly (see Sezione�3.1). 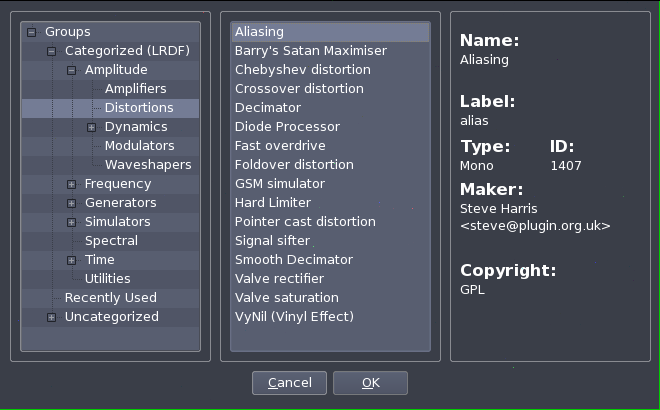 If things sound bad and distorted, start by turning down the gain setting on the layer... especially if it's larger than 1.0. Then turn down the instrument gain. Then any gain on a LADSPA effect. Then the fader on the mixer. Then the master output fader. Try to use samples that are -6 dB max. Visually, this means samples that peak at only 1/2 of full scale. Otherwise, turn your layer gain to about .5. The ADSR will not be longer than your sample. If you have a short sample, it doesn't matter how long you set the attack and delay — the sample will stop playing at the end. In this section you can find more info about defining MIDI actions and how they can be useful for you. Before you can work with midi actions you should have your Midi devices, drivers and connections configured correctly (see Sezione�3.3). The Param. (parameter) value to the right of the Event is the identifier of the note/button/controller that is linked to this Action. This parameter can be entered manually, or automatically by using the Midi learn function (see Sezione�3.3). The attack, decay, and release parameters are all set by the number of audio samples. This means that the time changes depending on the sample rate of your sound card. The max time for each of them is 100,000 audio samples (typ. 2.27 sec at 44.1 kHz). Hydrogen has 2 main modes: "Pattern" mode and "Song" mode (refer to Sezione�4 for the buttons that activate each mode). When "Pattern" mode is activated the current pattern is continuously repeated. This mode is very well suited to tweak your pattern until it's just right, since the pattern you are working on is constantly repeated. This way you can immediately hear the changes you have made. In "Song" mode the whole song is played. This is useful when putting together the patterns to create the structure of the song. Once patterns are created (Figura�3.2), we can copy/paste/delete them using the Select Mode (see Sezione�5.1). Ovviamente in qualsiasi momento e' possibile aprire ed utilizzare la finestra del mixer (Fig. 14), sia durante la fase di creazione dei pattern, sia durante l'esecuzione delle sequenze. A type of envelope generator that allows you to control the Attack, Decay, Sustain, and Release parameters. Generally, the parameters are proportional to the velocity. In Hydrogen, the ADSR envelope generator only controls the volume (attenuation). Vedi anche Envelope Generator, Attack, Decay, Sustain, Release. This is the first phase of an ADSR envelope, and is the amount of time to turn the parameter up from 0 to full velocity after triggering the note. In filters and mixers, this the amount that a signal is reduced (volume). Vedi anche Filter, High-Pass Filter, Low-Pass Filter. A phenomenon that happens to a signal when the signal is too large for whatever is receiving it. The peaks of the signal (which are normally smooth curves) get cut off straight at the max volume (clipped). This distorts the sound and is usually undesirable. An example of clipping is when you play music louder than your speaker can handle. Parts of the music sound harsh and fuzzy. On high-pass and low-pass filters, this is the frequency that divides between those that pass, and those that are attenuated (silenced). In a high-pass resonance filter, or a low-pass resonance filter, the cutoff is also the frequency zone that gets boosted. For example, if you have a low-pass filter and you set the cutoff frequency high (i.e. 20kHz)... the filter will not affect the sound. All the audible frequencies will pass through undisturbed. As you lower the cutoff frequency to something like 40 Hz (the low string on a bass guitar), it sounds like someone is putting a blanket over the speaker. The higher frequencies are being attenuated above 30 Hz. Vedi anche Filter, High-Pass Filter, Low-Pass Filter, Resonance Filter. After reaching full velocity from the attack, this is the amount of time to turn the parameter down from full velocity to the sustain level. A way to control (change) a parameter over time as a response to triggering, holding, and releasing a note. A slider control used to adjust the attenuation (volume) in a mixer. Faders always have an "audio" taper, which means that the attenuation amount changes on an exponential scale. A device that changes a sound by attenuating specific frequencies. A tone knob is an example of a simple, low-pass filter. Vedi anche Band-Pass Filter, High-Pass Filter, Low-Pass Filter, Resonance Filter. In an amplifier, this adjust how much (or how little) a signal is amplified (volume). A higher gain value is a louder signal. A filter that attenuates (silences) low frequencies, but allows high frequencies to pass through. Vedi anche Filter, Cutoff Frequency. In Hydrogen, an instrument is a single noise-maker (like a bass drum kick, or a tom). In an instrument you can load several different samples (each one called a layer), and have a different sample play depending on the velocity of the note. Only one sample at a time will play. Suppose you have a sample of a floor tom being struck softly. If you simply play the sample louder — it will not sound the same as a real tom that has been struck very hard. If you wish to mimic this in your instrument, you can load one sample for soft playing, and a different sample for loud playing. To make no noise. A setting on an instrument that prevents any audio output. A group of instruments (samples) that should mute (stop playing) immediately after another instrument in the group is triggered. This is typically used in hi-hats, where there's a different instrument (sample) for when the hi-hat is open or closed. With a real hi-hat, the sound of the open hi-hat will stop as soon as you close it. However, if you use two samples — the open sound will continue even after you have triggered the closed sound. By placing both instruments in the same mute group (group #1, for example)... triggering closed sound will immediately stop the open sound (and vice versa). A span of frequencies where the top-most frequency is exactly twice the frequency of the bottom frequency. For example, the range 20 Hz to 40 Hz is an octave. So is 120 Hz to 240 Hz, and 575 Hz to 1150 Hz. While the frequency differences are very different (20 Hz, 120 Hz, and 575 Hz, respectively), to the human ear they sound like the same distance. After the note is released, this is the amount of time to reduce the parameter from the sustain level to 0. When referring to a resonance filter, this is the parameter that determines how much of a boost (gain) to give the frequencies at the cutoff. A filter that gives a large boost to a very narrow range of frequencies. Typically it will be part of a high-pass or a low-pass filter, where the boosted frequencies are centered on the cut-off frequency. Vedi anche Filter, Cutoff Frequency, Resonance. This is the amount that frequencies are attenuated (suppressed) as the frequency changes (typically measured in dB/octave). A short recording of a sound, typically between .1 and 3.0 seconds long. The level to hold the parameter after finishing the decay time. This level will be maintained until the not is released. MIDI devices are required to send this information along with the note. Synthesizers use this information to adjust several parameters on the sample (typically the volume). In Hydrogen, it is only used to adjust how loud the sample is played back.